What if you can open your front door even without your keys or your smartphone? That can be so convenient, right? If you’re having trouble getting your keys out of your pocket while carrying your bags of groceries or your sleeping kid, then Okidokeys Smart Lock is good news for you. It’s very smart that it can automatically open the door for you and even close it once you’re inside. It gives you more ways than one in opening your door. The Okidokeys takes approximately less than an hour to set up in your home. It’s designed to work with most single cylinder type deadbolt locks. However, if you have the mortise or the rim cylinder type, Okidokeys may not work for you. It doesn’t require you to drill holes or to purchase long cable lines. You simply need to replace your existing standard deadbolt on the interior side of your door and you can enjoy an automated door lock at home. Once installed, you can use your iOS or your Apple device to take control of your security. The Okidokeys Smart Locks works with Bluetooth Technology, preferably Bluetooth 4.0. The Okidokeys Smart Lock has a very interesting set of capabilities. It can let you unlock your doors just by using your smart phones, its smart tags or even with without using your hands. Okidokeys Smart Lock allows you to give accesses to people you trust. For one, you can give a smart card to your technician or send an access to your housecleaner. You can also give your kids smart wristbands to wear and you can keep the smart card in your wallet in cases of emergencies. The Okidokeys also lets you set a specific duration on how long those accesses last. Each time an access is made, you’ll instantly receive a notification along with entry details. It even allows you to set your door to unlock by handsfree mode. Since the device works on bluetooth, it’s easier for the Smart Lock to detect your phone. Once it detects that you’re near your door, it automatically unlocks. You must keep in mind, however, that you need to keep the app on background mode for it to work. The Okidokeys doesn’t completely stop you from using your existing metal keys. You can continue using it if you want. The Okidokeys Smart Locks gives you three packages to choose from. The Smart Lock Covers comes in three colors. They are made of plastics but are good enough to blend in with your door’s motif. If you don’t find the colors very interesting, Okidokeys gives you the option to choose from Colorware’s 56 color palettes. If you already have one, you can send in your unit and have it personalized. The Homekey License, on the other hand, is available in the free and the upgrade version. The Homekey license comes free of charge and can deliver an unlimited number of notifications and activity records to you. It also gives you unlimited sharing as well as removing of access from your trusted friends and family members. The Homekey license also allows you to control 5 devices and to manage 10 users along with their time shifts. The Homekey also comes with 10 SMS key sharing. If you want the upgraded version, you can purchase one at $24.99 per year. This version gives you the same unlimited access to logs, notifications and locking and unlocking capabilities. What makes this version different from the Homekeys is that it gives you the ability to control an unlimited number of devices. It also allows you to manage an unlimited number of users and time-shifts. You also get an unlimited number of sharing and removing of access from people you trust. This feature is actually good if you are running rental homes. The benefits can be greater knowing that Okidokeys actually works with the RentEZ apps. What this partnership does is that it brings your renters a vacation guide where they can easily see amenities and events. As the owner, you’ll have a more convenient way of handing your renters, particularly with sharing and removing their access keys. The Smart Reader is installed outside of your home and placed next to your door. It allows keyless entry using Smart Tags and even non-smart phones. These Smart Tags work without batteries which makes Okidokeys even more convenient to use. The tags can also help you in monitoring your child’s arrival from school. You can simply let him wear the wristband and the Smart Reader can send you a notification on what time he got home. 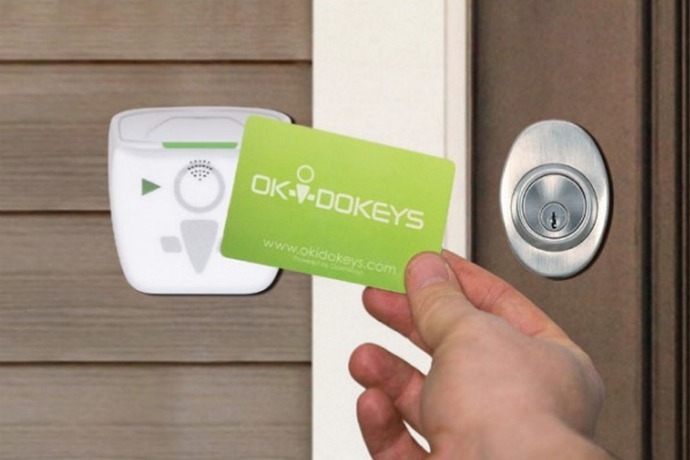 The Okidokeys Smart Reader can also be your doorbell, if you prefer. The Okidokey Smart Gateway enables you to control your Smart Locks through the app and the website. It connects to your Wi-Fi network and allows you to control your doors even if you’re not home. Although not shipping yet, the Smart Gateway can be your link in connecting your Okidokeys with home automation possibilities. The Okidokeys family also includes the Smart Gate and the Smart Garage. They work by the same principle of allowing entry by using your smart tags and the mobile app. They are sold separately but comes with the same price tag of $199.99. You can get the Okidokey Smart Locks through its order page. Along with the packages, you can also purchase separate sets of Smart Tags just in case you can’t get enough of Okidokey’s cleverness.